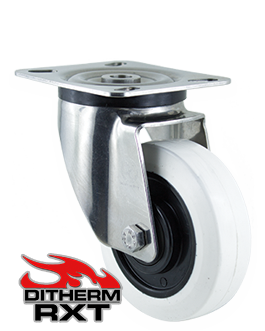 What is the Ditherm® line? 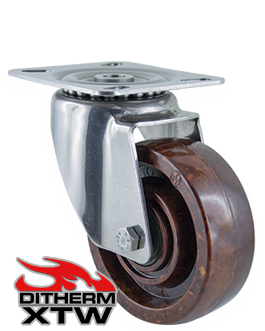 The line of products Ditherm® is the widest and most complete range of wheels and castors specifically studied, developed and manufactured from DC Di Candia Ruote since year 1959. This range includes a full series of products to cover any need for use in temperatures, from -70°C ( -94°F ) to +400°C ( +752°F), fully certified for use in food indystry environment and for contacts with foods. 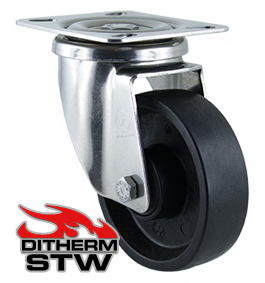 The whole Ditherm range is manufactured with exclusively self-developed material, studied and developed in DC research lab, and manufactured internally through the latest process technologies. 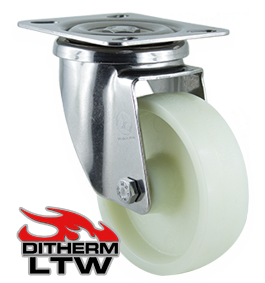 Ditherm wheels are Made in Italy, produced in our plant in Besnate and certified, and are phenolic free in compliance with the latest rules on materials for food processing and baking. This range includes wheels with incredible mechanic strength like the STW series and elastic rubber wheels guaranteed against tread de-bonding up to +300°C like the RHT and RXT series, and every type of wheel to meet any request in the demanding sector of the high and low temperature industry. © 2018 DC Di Candia Ruote. 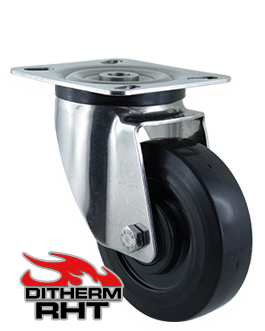 Wheels and castors manufacturer. All Rights Reserved.